The House of Imagination will open up its doors to children and their families, young people, artists and educators to explore the world of the imagination. We will be exploring ideas for the Forest of Imagination 2017 using the theme Where do we feel at home? To discuss the meanings of monitoring, evaluation, research and communication within 5x5x5=creativity in order to clarify what we are doing and why, with the ultimate aim of understanding the nature and value of our work from an internal and external viewpoint. On 3–6 June 2016 Forest of Imagination takes root in Bath for its third year. Come and immerse yourself in a playful programme of sensory installations, artworks, outdoor theatre and participatory creative activities at this four-day contemporary arts event. Free and designed for all ages. 5x5x5=creativity is inviting artists and creative professionals along with children, young people and adults to explore and test ideas for House of Imagination, Forest of Imagination and City of Imagination. 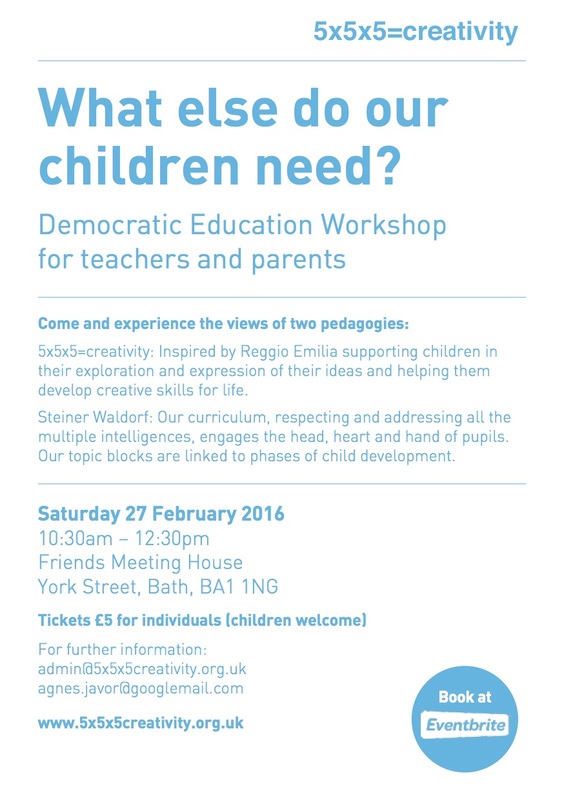 Come and hear the progress of our project to get Bath accredited as a Unicef Child Friendly City and show your support with ideas of how you and your organisation would benefit. 5x5x5=creativity: Inspired by Reggio Emilia supporting children in their exploration and expression of their ideas and helping them develop creative skills for life. Steiner Waldorf: Our curriculum, respecting and addressing all the multiple intelligences, engages the head, heart and hand of pupils. Our topic blocks are linked to phases of child development. Join 5x5x5=creativity and partners for an hour of inspirational talks and films about children’s right to arts, creativity and culture as part of the launch weekend for the United Nations Global Goals. 5. ecl foundation presentations from South Africa, Namibia and Netherlands: how can we release the inherent creativity and desire to learn of children and young people around the world? 6. Pledges: What are our pledges for Bath as a Child Friendly City and Community? What are your ideas for a Child Friendly City and Community that match the Global Goals?